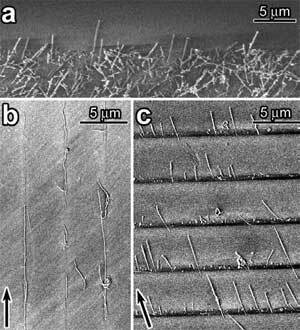 (Nanowerk News) Researchers at UC Berkeley, led by Prof. Alex Zettl, have developed a combination of novel room temperature methods for both aligning and selectively depositing nanotubes onto a topologically benign surface. Using these methods, which can easily be integrated into semiconductor manufacturing processes, they have fabricated arrays of aligned torsional NEMS devices based on MWCNTs. The research report "Controlled placement of highly aligned carbon nanotubes for the manufacture of arrays of nanoscale torsional actuators" was published in the Dec. 15, 2005 issue of Nanotechnology. Recent advances in nanoscale synthesis and fabrication techniques have opened the door to the manufacture of true nano-electromechanical systems (NEMS). For example, multiwall carbon nanotubes (MWCNTs) have been utilized as key enabling elements for nanoscale electrostatically driven torsional and rotational actuators, orders of magnitude smaller than their microelectromechanical (MEMS) counterparts. Due to their small size, robust design and near-perfect atomic structure, such constructs hold great promise as building blocks for complex nanoelectromechanical systems. The utility of individual actuators can be significantly increased by their incorporation into arrays of devices. Such arrays could serve in a variety of applications, including adaptive optics, high frequency mechanical filters, mass sensors, and microfluidic gates and pumps. A fundamental challenge in the development of NEMS arrays (and of nanotube- and nanowire-based devices in general) is the large-scale controlled placement of molecular sized building blocks on a substrate. Methods based on chemical vapour deposition (CVD) avoid this problem by, for example, growing nanotubes directly on the substrate where they ultimately will be located. Unfortunately, such methods are unable to produce very high quality multi-walled carbon nanotubes as are often required for NEMS applications. Furthermore, CVD is commonly a high temperature process, which severely limits compatibility with substrate materials or other system components. Hence there is much interest in low temperature techniques to aid in the selective placement and alignment of prefabricated nanostructures. There has been some progress in developing fluidic techniques for aligning nanowires and nanotubes, and various functionalization schemes have been explored for placing nanotubes on particular areas of a substrate. Unfortunately, most of these methods necessitate rather complex substrate topology or involved and limiting chemistry. In summary, the researchers have fabricated arrays of torsional actuators using a novel nanotube positioning technique. The nanotubes are oriented by fluid flowacross a spinning substrate and adhere preferentially to regions that have been activated by a focused electron beam. The adhesion is found to be due to extreme modification of a residual polymer layer already present in lithographic work. By varying the flow direction and electron beam exposure we are able to deposit nanotubes in a variety of patterns that can then be contacted by standard lithography. Our ability to orient and preferentially place molecular structures paves the way for their integration into mass produced devices. Aside from the torsional actuator array already described, an immediate, simple application is the use of nanotubes as electrical interconnects between units of an integrated circuit (especially desirable due to their ability to carry extremely high electrical and thermal current densities). The unique physical properties of carbon nanotubes could be harnessed in other applications as well, such as high density arrays of field effect transistors, gas sensors or biosensors. Alternative geometrical configurations, including radially aligned nanotubes, crossed nanotubes etc, could be easily fabricated using the techniques described here.